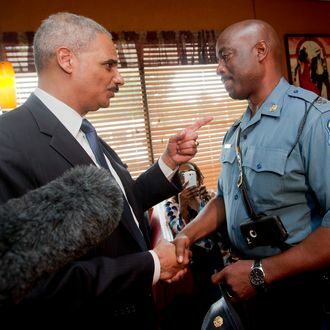 Eric Holder scolds a Missouri State Highway patrolman. A Department of Justice report that could be released as early as this week has found racial bias in some Ferguson police department procedures, according to sources who spoke with the New York Times. Though the DOJ will reportedly clear Officer Darren Wilson in the shooting of teenager Michael Brown that sparked nationwide anti-police protests this summer, the new report will cite “discriminatory traffic stops,” saying officers primarily ticketed African-Americans in order to pad their budget with the fines. Once the report is released, the Ferguson police department could face civil rights charges from the DOJ unless they reach a settlement.